I want to take few minutes to highlight a few papers from CHI 2011, spread across a couple of posts. There was lots of good work at this conference. This post will focus on papers in the persuasive technology and social software for health and wellness space, which is the aspect of my work that I was thinking about most during this conference. Fit4life is a hypothetical system that monitors users’ behavior using a variety of tactics in the Persuasive Systems Design model. After describing the system (in such a way that someone in the room commented made the audience “look horrified”), the authors transition to a reflection on persuasive technology research and design, and how such a design can “spiral out of control.” As someone working in this space, the authors hit on some of the aspects that leave me a bit unsettled: persuasion vs. coercion, individual good vs. societal good, whether people choose their own view points or are pushed to adopt those of the system designers, measurement and control vs. personal experiences and responsibility, and increased sensing and monitoring vs. privacy and surveillance and the potential to eliminate boundaries between front stage and back stage spaces. The authors also discuss how persuasive systems with very strong coaching features can reduce the opportunity for mindfulness and for their users to reflect on their own situation: people can simply follow the suggestions rather than weigh the input and decide among the options. This is a nice paper and a good starting point for lots of discussions. I’m a bit frustrated that it was presented in a different yet concurrent session as the session on persuasive technology for health. As such, it probably did not (immediately) reach the audience that would have led to the most interesting discussion about the paper. In many ways, it argued for a “think about what it is like to live with” rather than “pitch” approach to thinking about systems. I agree with a good bit of the potential tensions the authors highlight, but I think they are a bit harder on the persuasive tech community than appropriate: in general, persuasive tech folks are aware we are building systems intended to change behavior and that this is fraught with ethical considerations, while people outside of the community often do not think of their systems as persuasive or coercive, even when they are (again, I mean this in a Nudge, choice-environments sense. On the other hand, one presentation at Persuasive last year did begin with the statement “for the sake of this paper, set aside ethical concerns” (paraphrased), so clearly there is still room for improvement. Based on interviews with nineteen individuals, the authors present an overview of approaches for how to involve peers in technology for weight management. These approaches fall into passive involvement (norms and comparisons) and five types of active involvement (table 1 in the paper): obstructive (“don’t do it”), inductive (“you should do it”), proactive (“do it with me”), supportive (“I’ll do it too”), and cooperative (“let’s do it together”). The last category includes competition, though there was some disagreement during the Q&A about whether that is the right alignment. The authors also find gender- and role- based differences in perceived usefulness of peer-based interventions, such as differences in attitudes about competition. Designers could use these types of engagement to think about what their application are supporting well or not so well. Here, I wish the authors had gone a bit further in linking the types of involvement to the technical mechanisms or features of applications and contexts, as I think that would be a better jumping off point for designers. For those thinking about how to design social support into online wellness interventions, I think this paper, combined with Skeels et al, “Catalyzing Social Support for Breast Cancer Patients”, CHI 2010 and our own paper from CSCW 2011 (“‘It’s not that I don’t have problems, I’m just not putting them on Facebook’: Challenges and Opportunities in Using Online Social Networks for Health”), offer a nice high-level overview of some of the challenges and opportunities for doing so. default choice: a robot showing all snack choices with equal convenience or the healthy one more visibly, or a website that showed all snack choices (in random order) or that paginated them, with healthy choices shown on the first page. planning: asking people to order a snack for tomorrow rather than select at the time of consumption. information strategy: showing calorie counts for each snack. As one would expect, default choice strategy was highly effective in increasing the number of people who chose the healthy snack (apples) rather than the unhealthy snack (cookies). The planning strategy was effective among people who had a healthy snacking lifestyle, while those who snacked unhealthily continued to choose cookies. Interestingly, the information strategy had no effect on healthy snackers and actually led healthy snackers to choose cookies more than they otherwise would have. The authors speculate that this is either because the healthy snackers overestimate the caloric value of cookies in the absence of information (and thus avoid them more), or because considering the healthy apple was sufficiently fulfilling even if they ultimately chose the cookie. Some questions the study leaves open are: would people behave they same if they had to pay for the snacks? what would happen in a longer term deployment? What would have happened if the cookies were made the default, particularly for otherwise healthy snackers? Interviews with 20 Wii Fit users revela side effects of this use: some stop using it because it did not work while others stop because they go on to other, preferred fitness activities (abandonment as success), a tension between whether the Fit is viewed as a game or exercise tool (people rarely view it as both), and negative emotional impacts (particularly frustrating when the system misinterpreted some data, such as weight gains). One suggestion the authors propose is that behavior change systems might start with activities that better resemble games but gradually transition users to activities with fewer game-like elements, and eventually wean users off of the system all together. In practice, I’m not sure how this would work, but I like this direction because it gets at one of my main critiques of gamification: take away the game and its incentives (which my distract from the real benefits of changing one’s behavior) and the behavior reverts quite quickly. Lab experiment evaluating the effects of using multiple sources of advice (single expert or consensus of similar others) at the same time, disclosing that advice is intended to persuade, and allowing users to select their source of advice. (This is framed more generally as about persuasive systems, but I think the framing is too broad: it’s really a study about advice.) Results: people are more likely to follow advice when they choose the source, people are less likely to follow advice when they are told that it is intended to persuade, and when shown expert advice and consensus advice from similar others, subjects were less likely to follow the advice than when they were only shown expert advice — regardless of whether the expert and consensus advice concurred with each other. This last finding is surprising to me and to the authors, who suggest that it may be a consequence of the higher cognitive load of processing multiple sources of advice; I’d love to see further work on this. Aggregation of literature review, interviews with sleep experts, a survey of 230 individuals, and 16 potential users to learn about opportunities and challenges for designing sleep technologies. The work leads to a design framework that considers the goal of the individual using the system, the system’s features, the source of the information supporting the design choices made, the technology used, and stakeholders involved, and the input mechanism. During the presentation, I found myself thinking a lot about two things: (1) the value of design frameworks and how to construct a useful one (I’m unsure of both) and (2) how this stacks up against Julie’s recent blog post that is somewhat more down on the opportunities of tech for health. The authors argue that evaluating behavior change systems based solely on whether they changed the behavior is not sufficient, and often infusible. Instead, they argue, HCI should focus on whether systems or features effectively implement or support particular strategies, such as self-monitoring or conditioning, which can be measured in shorter term evaluations. I agree with much of this. I think that more useful HCI contributions in this area speak to which particular mechanisms or features worked, why and how they worked, and in what context one might expect them to work. Contributions that throw the kitchen sink of features at a problem and do not get into the details of how people reacted to the specific features and what they features accomplished may tell us that technology can help with a condition, but do not, in general, do a lot to inform the designers of other systems. I also agree that shorter-term evaluations are often able to show that particular feature is or is not working as intended, though longer term evaluations are appropriate to understand if it continues to work. I am also reminded of the gap between the HCI community and the sustainability community pointed out by Froehlich, Findlater, and Landay at CHI last year, and fear that deemphasizing efficacy studies and RCTs will limit the ability of the HCI community to speak to the health community. Someone is going to have to do the efficacy studies, and the HCI community may have to carry some of this weight in order for our work to be taken seriously elsewhere. Research can make a contribution without showing health improvements, but if we ignore the importance of efficacy studies, we imperil the relevance of our work to other communities. Four month deployment of a system for monitoring medication taking and phone use in the homes of two older adults. The participants sought out anomalies in the recorded data; when they found them, they generally trusted the system and focused on explaining why it might have happened, turning first to their memory of the event and then to going over their routines or other records such as calendars and diaries. I am curious if this trust would extend to a purchased product rather than one provided by the researchers (if so, this could be hazardous in an unreliable system); I could see arguments for it going each way. The authors found that these systems can help older remain aware of their functional abilities and helped them better make adaptations to those abilities. Similar to what researchers have recommended for fitness journals or sensors, the authors suggest that people be able to annotate or explain discrepancies in their data and be able to view it jointly. They also suggest highlighting anomalies and showing them with other available contextual information about that date or time. I generally agree with Sunny Consolvo: feedback and consequences in persuasive systems should generally range from neutral to positive, and have been reluctant (colleagues might even say “obstinate”) about including it in GoalPost or Steps. Julie Kientz’s work, however, finds that certain personalities think they would respond well to negative feedback. This work in progress tests negative (“aversive”) feedback: Facebook posts about songs and the statement that they were using lots of energy in a pilot with five participants. The participants seemed to respond okay to the posts — which are, in my opinion, pretty mild and not all that negative — and often commented on them. The authors interpret this as aversive feedback not leading to disengagement, but I think that’s a bit too strong of a claim to make on this data: participants, despite being unpaid but having been recruited to the study, likely felt some obligation to follow through to its end in a way that they would not for a commercially or publicly available system, and, with that feeling, may have commented out of a need to publicly explain or justify their usage as shown in the posts. The last point isn’t particularly problematic, as such reflection may be useful. Still, this WiP and the existence of tools like Blackmail Yourself (which *really* hits at the shame element) do suggest that there is more work needed on the efficacy of public, aversive feedback. In my work, I’ve heard a lot of concern about posting health related status updates and about seeing similar status updates from others, but I haven’t taken a detailed look at the status updates that people are currently making, which this WiP makes a start on for physical activity posts on Twitter.By analyzing the results of queries for “weight lifting”, “Pilates”, and “elliptical”, the authors find posts that show evidence of exercise, plans for exercise, attitudes about exercise, requests for help, and advertisements. As the authors note, the limited search terms probably lead to a lot of selection bias, and I’d like to see more information about posts coming from automated sources (e.g., FitBit), as well as how people reply to the different genres of fitness tweets. Fun yet concerning alt.chi work on pushing people to smile in order to increase positive mood. With features such as requiring a smile to open the refrigerator, positive feedback (lights, music) in exchange for smiles, automatic sharing of photos of facial expressions with friends or family members, automatic posting of whether or not someone is smiling enough, this paper hits many of the points about which the Fit4life authors raise concerns. The panel I co-organized with Margaret E. Morris and Sunny Consolvo, “Facebook for health: opportunities and challenges for driving behavior change,” and featuring Adam D. I. Kramer, Janice Tsai, and Aaron Coleman, went pretty well. It was good to hear what everyone, both familiar and new faces, is up to and working on these days. Thanks to my fellow panelists and everyone who showed up! There was a lot of interesting work — I came home with 41 papers in my “to read” folder — so I’m sure that I’m missing some great work in the above list. If I’m missing something you think I should be reading, let me know! For those interested in the software that drives the SIDisplay, SI master’s student Morgan Keys has been working to make a generalized and improved version available. You can find it, under the name “@display” at this GitHub repository. SIDisplay is a Twitter-based public display described in a CSCW paper with Paul Resnick and Emily Rosengren. We built it for the School of Information community, where it replaced a number of previous displays, including a Thank You Board (which we compare it to in the paper), a photo collage (based on the context, content & community collage), and a version of the plasma poster network. Unlike many other Twitter-based displays, SI Display and @display do not follow a hashtag, but instead follow @-replies to the display’s Twitter account. It also includes private tweets, so long as the Twitter user has given the display’s Twitter account permission to follow them. When preparing our Persuasive 2010 paper on Three Good Things, we ended up cutting a section on using word clouds to support reflection. The section wasn’t central to this paper, but it highlights one of the design challenges we encountered, and so I want to share it and take advantage of any feedback. Our Three Good Things application (3GT) is based on a positive psychology exercise that encourages people to record three good things that happen to them, as well as the reasons why they happened. By focusing on the positive, rather than dwelling on the negative, it is believed that people can train themselves to be happier. When moving the application onto a computer (and out of written diaries), I wanted to find a way to leverage a computer’s ability to analyze a user’s previous good things and reasons to help them identify trends. If people are more aware of what makes them happy, or why these things happen, they might make decisions that cause these good things to happen more. In 3GT, I made a simple attempt to support this trend detection by generating word clouds from a participant’s good things and reasons. I used simple stop-wording, lowerizing, and no stemming. I like having the word cloud. I noticed that the biggest thing in my reason words is “cat”. (Laughs). And the top good words isn’t quite as helpful, because I’ve written a lot of things like ‘great’ and ‘enjoying’ – evidently I’ve written these things a lot of times. So it’s not quite as helpful. But it’s got ‘cat’ pretty good there, and ‘morning’, and I’m not sure if that’s because I’ve had a lot of good mornings, or I tend to write about things in the morning. Another participant who had examined the word cloud noticed that “people” was the largest tag in his good things cloud and “liked that… [his] happiness comes from interaction with people,” but that he did not think that this realization had any influence over his behavior outside of the application. One participant reported looking at the word clouds shortly after beginning to post. The words selected did not feel representative of the good things or reasons he had posted, and feeling that they were “useless,” he stopped looking at them. He did say that he could imagine it “maybe” being useful as the words evolved over time, and later in the interview revisited one of the items in the word cloud: “you know the fact that it says ‘I’m’ as the biggest word is probably good – it shows that I’m giving myself some credit for these good things happening, and that’s good,” but this level of reflection was prompted by the interview, not day-to-day use of 3GT. It was like you had taken random words that I’ve typed, and some of them have gotten bigger. But I couldn’t see any reason why some of them would be bigger than the other ones. I couldn’t see a pattern to it. It was sort of weird… Some of the words are odd words… And then under the Reason words, it’s like they’ve put together some random words that make no sense. Word clouds did sometimes help in ways that we had not anticipated. Though participants did not find that they helped them identify trends that would influence future decisions, looking at the word cloud from her good things helped at least one participant’s mood. I remember ‘dissertation’ was a big thing, because for a while I was really gunning on my dissertation, and it was going so well, the proposal was going well with a first draft and everything. So that was really cool, to be able to document that and see… I can see how that would be really useful for when I get into a funk about not being able to be as productive as I was during that time… I like the ‘good’ words. They make me feel, I feel very good about them. The importance of supporting reflection has been discussed in the original work on Three Good Things, as well as in other work that has shown how systems that support effective self-reflection can improve users’ ability to adopt positive behaviors as well as increase their feelings of self-efficacy. While some users found benefit in word clouds to assist reflection, a larger portion did not notice them or found them unhelpful. More explanation should be provided about how word clouds are generated to avoid confusion. They should also perhaps not be shown until a participant has entered a sufficient amount of data. 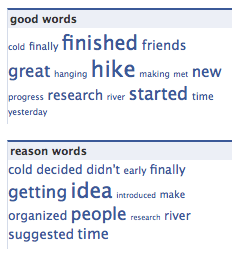 To help participants better notice trends, improved stop-wording might be used, as well as detecting n-grams (e.g. “didn’t smoke” versus “smoke”) and grouping of similar terms (e.g., combining “bread” and “pork” into “food”). Alternatively, a different kind of reflection exercise might be more effective, one where participants are asked to review their three good things posts and write a longer summary of the trends they have noticed. One of the greatest things about having a claimID page is that you can easily provide people searching for you with a real picture of your identity. With claimID you can claim your blog, your website and news articles that mention your name into a central place. If someone is searching for you, they previously might not have found all of those important pages. With claimID, you can put your best face forward and let people see the identity you wish to present. It’s an interesting idea, but I had a lot of trouble figuring out the right way to use it. I manage my online “identity” through my website, including this blog, and various sites including flickr, linkedin, upcoming, and even last.fm. Links to things about me can sometimes go on del.icio.us under the aboutme tag, but that’s something I try not to do too often. ClaimID, aside from providing an OpenID account, did not really fill a new enough a niche for me to continue using it. Earlier this month, ClaimID added an OpenID and XFN based contact system. It is a first step, and in its current implementation the value proposition is pretty thin. The blog post announcing the new feature talks about the relationship between contacts and reputation — fair enough, but LinkedIn seems to have staked out that territory already. That does not stop me from being a bit excited about the feature and its potential, and it makes ClaimID’s territory a lot more interesting. My optimism for OpenID + XFN is that it can enable a single-sign-on version of social networking. This isn’t a problem whose solution can be distributed as easily as OpenID style authentication — everyone’s OpenID server could start serving up a list of the OpenIDs of their friends, but with such a decentralized approach, identifying people that are more than one degree away starts to get very expensive — but it has its appeal. Imagine an eBay or Amazon Marketplace style transaction, only know you know that you are a 3rd degree contact of the seller — someone in your network knows someone in their network. This changes the transaction experience. This is the basic idea behind LinkedIn’s hiring and B2B services sections. There are many web applications where knowing users’ social networks can add value, but it might not add enough value to get users to go through the process of adding their contacts. Importing social networks (privacy concerns aside) might also allow a site to identify n-degree connections between the site’s users, even if someone in the network is not a user of the site. Importing social networks also can help handle the cold start problems on many social sites. Going back to the eBay or Amazon example, adding social information to a transaction may be most important for first time sellers and buyers, but these are also the people are most likely to need that added bit of reputation since they have not otherwise developed one on the site. Of course, there are some challenges to this use of social networks that go beyond implementation details. My Flickr contacts are not my LinkedIn contacts, and I don’t really want them to overlap. I doubt that the current XFN profile offers users enough flexibility to manage who gets to be a contact on which website just by filtering values. This may mean that an OpenID approach to social networks may be limited to websites in which social social networks are not a central feature. I’m not the first person to get excited about the combination of social networks and OpenID, and claimid is not the first OpenID service to manage relationships. It’s an encouraging sign of things to come, and I’m hopeful that there is some good momentum building in this direction. When I first started looking at my friends’ Netflix lists, it felt a little creepy. The records of our cultural consumption (video rentals, library checkouts) have traditionally been protected by law. for all kinds of excellent reasons—tyrants, stalkers, mothers-in-law—so even though I’d been invited to look, my conscience kept telling me I’d crossed into sacred territory. I felt like an information-age window peeper, like I had dipped my toe into the shallow end of a pool whose deep end was Watergate. This feeling only intensified when many of my real-life friends refused to accept me as their Netflix friend. Though they’d talk to me all day about their DVD-watching habits—their three-month Buffy binges and methodical screenings of the entire Owen Wilson catalog—for some reason they wouldn’t let me see an actual list of the actual films they were actually renting. This paragraph caught my attention. Like many people who find something interesting but are not actually knowledgeable about it, I will now proceed to climb on to my tiny digital soapbox and talk about it for a moment. Much like the Netflix’s Friends feature, last.fm profiles show a user’s actual behavior rather than a reported behavior. Compare this to what users list on Facebook or other profiles for their favorite music and movies. Those are representations users choose, and what people say they do is rarely exactly what they do. I’m curious, then, if services like last.fm and Netflix friends will change how people express themselves in listing favorite music or movies. I used to think a little bit before filling in my favorite music or answering what track is currently stuck in my head. Music that I considered to be a guilty pleasure (generally music that is catchy but not necessarily of great critical value, c.f. some songs by Coldplay) would usually not make these lists. This all stopped one day when I noticed that my Facebook list of favorite music had grown a ways apart from my last.fm profile. This was partly by design — the same sort of decisions that people make when deciding what books to put on office or living room shelves — and partly because what I thought I listened to most wasn’t necessarily what I do listen to most. I decided to fix it by just copying over my last.fm reported top tracks. My new method didn’t last very long. I started thinking that certain artists seemed to be missing, and quickly tack them back on to the end of the list. Sure, I’d rationalize it by saying “oh, she’s new,” or “well, they’ve only put out one album, so of course they get overwhelmed by more prolific artists.” The truth is, there was a discrepancy between what last.fm reported and what I wanted to list, and I felt a need to fix it. Are tools that report our actual cultural consumption at odds with our ability to choose how we express ourselves? Does it matter? I can’t say that I’m going anywhere with these thoughts (and I can say that I don’t know the first thing about self expression and identity), but I’ve been thinking about this on and off for a few days.